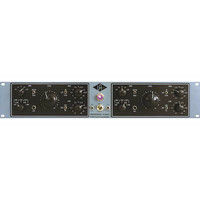 The Universal Audio 2-610 is a two-channel tube microphone preamplifier based on the legendary Universal Audio 610 modular console. Third in the Universal Audio Classics product line the 2-610 follows the 1176LN Limiting Amplifier and Teletronix LA-2A Leveling Amplifier in our commitment to authentic analog recording technology. This entry was posted in Universal Audio and tagged Recording-and-Computers. Bookmark the permalink.